Tourism and Events Queensland (TEQ) is a bold and ambitious global destination renowned for its remarkable campaigns. One such campaign, “24 Hours in Queensland,” brought international filmmakers to Queensland to experience the Australian state for only 24 hours before being flown back home. Another campaign, “Room 753,” invited busy travel influencers to rejuvenate for a week at TEQ’s exclusive accommodation – a luxury suite with an ocean view, customized to the tastes of each guest. And in “The Best Job In The World,” TEQ shone the spotlight on the Great Barrier Reef, where contestants could apply to be the paid caretaker and official blogger of a picturesque island in Queensland. And then came “Surprise & Delight,” a campaign that demonstrated the evolving and valuable power of online listening – a testament to TEQ’s willingness to innovate. It revealed that rewards come your way when you commit to pushing the envelope. 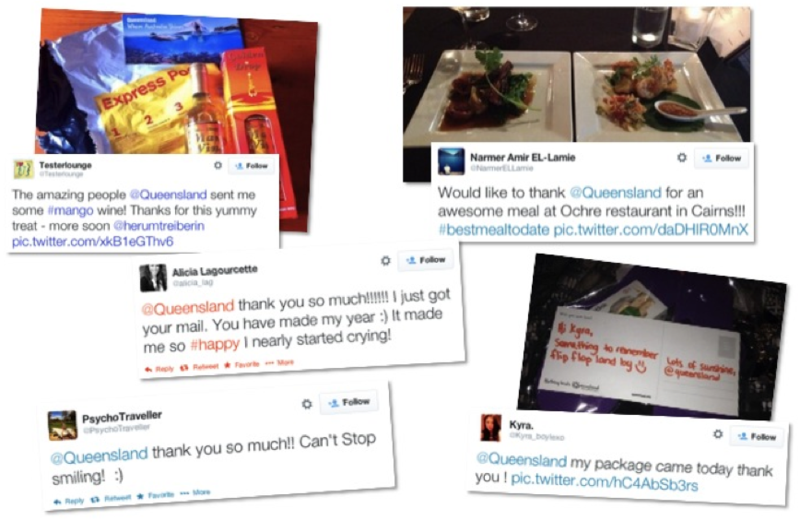 In the fall of 2013, TEQ launched a project with the goal of impressing travellers on the ground in Queensland with unexpected, customized trip enhancements in order to show the world that Queensland goes above and beyond for their valued visitors. To accomplish this, they initiated online conversations with influential visitors who would then spread the good word about Queensland as a remarkable destination. Inspired by Peter Shankman’s tweet to Morton’s Steakhouse, the Surprise & Delight program monitored conversations on Twitter and found opportunities to align tweets from the community with delightful surprises customized specifically to individual travellers. The project turned visitors into advocates, as the people who were surprised immediately turned to their peer network to rave about Queensland. It earned TEQ valuable word-of-mouth recommendations, it boosted Queensland’s reputation as a destination a step ahead of the rest and it made for some very happy travellers. Surprised travellers tweeted messages of thanks during the campaign. Tourism and Events Queensland is seen as a thought leader in the industry, and as such, the organization is faced with the challenge of retaining its reputation as a fun and engaging destination, while participating in initiatives that ultimately drive higher visitor expenditure in market. The Surprise & Delight campaign concept required a willingness for adventure on the part of the DMO, and fortunately, TEQ was eager to continue their track record of innovation. While the Surprise & Delight concept had some proof behind it online (including the Morton’s example above), DMOs had yet to engage in an ambitious listening project of this magnitude. In partnership with their agency, Destination Think!, a strategic plan was created to execute the concept. The resulting campaign embraced fun, capitalized on modern digital opportunities, and delivered tangible marketing success through authentic consumer word-of-mouth. Throughout the campaign, the responses were very positive. Travellers appreciated the personal touch demonstrated by TEQ and were happy to share that with their networks. To execute the campaign, a methodical approach was developed to find and monitor the online conversations of travellers during their time in Queensland. Using automated monitoring software, Twitter keyword searches were set up and conversations were initiated with visitors and analyzed individually. By following a range of relevant Twitter hashtags (e.g. 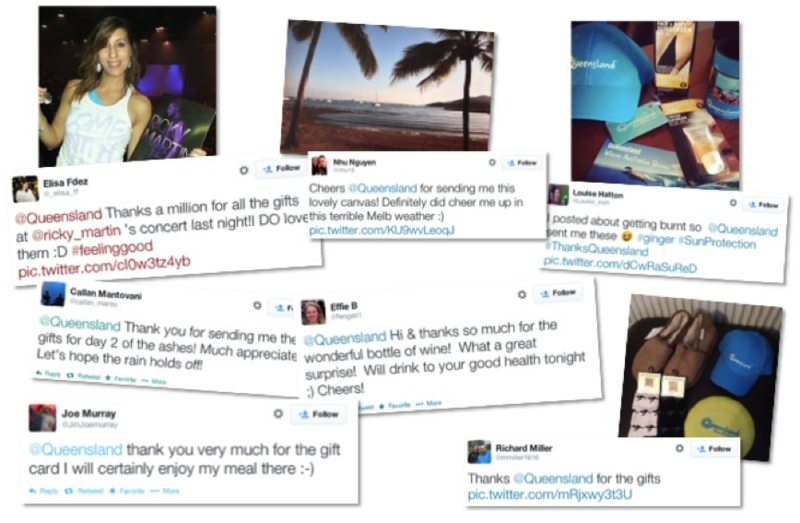 #Queensland, #ThisisQueensland), and by being diligent about responding to tweets sent directly to the @Queensland Twitter account, valuable opportunities to engage with visitors in the state were identified. Surprises were awarded to people who aligned with the campaign’s objectives and target audience. Recipients were qualified based on their demographic, interests in markets, and the size of their community online. Geographically targeted streams were set up using keywords tied to key Queensland experiences (e.g. kangaroo, snorkeling and outback). Whenever a visitor was determined to be a viable candidate for Surprise & Delight, the agency and TEQ connected to determine the best method of surprise. The goal was to earn as strong a reaction from the visitor as possible. Therefore, it was an ongoing process to find the next “Wow!” moment for people engaging with the destination. During the six-month initiative, search queries were streamlined in order to maximize the ability to strategically listen to relevant conversations. During this time, TEQ and its agency learned which opportunities were likely to be successful, and how to best approach different visitors – from casual travellers to online influencers. In total, 39 Twitter users were surprised in various ways during the program’s six-month duration. Surprises ranged from the simple (branded flip-flops and sunscreen for a visitor who hadn’t accounted for the Queensland sun), to the extravagant (5-star restaurant for a visiting foodie), to the downright unique, such as the surprise for Kate – a long-time follower of the @Queensland Twitter account who wanted to be a “koala cuddler” for a day. 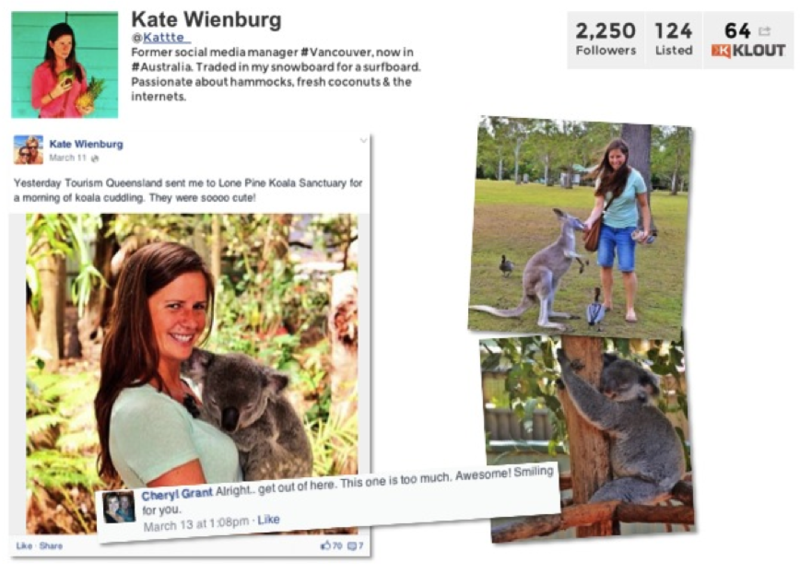 In addition to the Twitter conversations, Kate (shown above enjoying her koala cuddling experience) shared photos of the day on Facebook (70 likes, 7 comments) and Instagram (3 photos, 197 likes, 13 comments). Her blog post about the day included a thanks to TEQ with a link to the corporate website. Kate was identified when she retweeted one of TEQ’s “Best Jobs” blog posts about being a koala cuddler. Arrangements were made for her to spend the day cuddling koalas at the Lone Pine Koala Sanctuary. Not only did Kate tweet eight times during the day of her visit, she even wrote a blog post about the experience and tweeted it amongst her followers. Through this one act of goodwill shown by TEQ (and at a negligible expense), Kate became a powerful advocate for the destination. 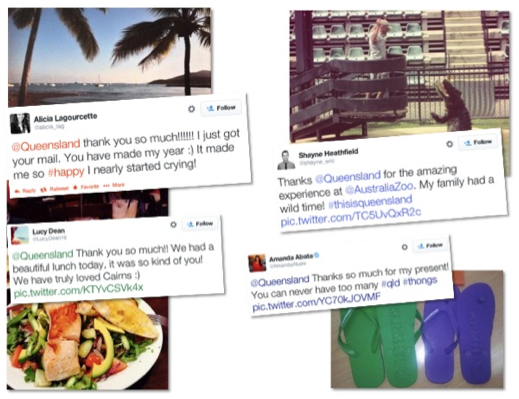 Between October and April, Kate tweeted 79 times using either #ThisIsQueensland or @Queensland. These 79 tweets amassed 795,000 total impressions. Given the number of followers that she has and the reach that they bring, the cost per impression was significantly lower than the industry standard. Kate’s account of her time in Queensland is only one example of the array of positive stories generated from visitors who ultimately share their stories with their friends and family. These authentic, unscripted stories have a significant impact on targeted communities – more than any mass marketing messaging can achieve through an advertising push. TEQ set up the experience, and let their fans do the marketing for them. Through the stories that they told, we were able to show a wider audience that Queensland is a destination that cares about their visitors, establishing a competitive edge in the tourism industry. The range of experiences provided and the variety of stories generated from surprised travellers was a testament to the effort to turn a cutting-edge idea into a successful destination marketing endeavor. The “Surprise & Delight” campaign was initially positioned as a six-month trial, but Tourism and Events Queensland was thrilled with the results, so they adopted it as an ongoing program. The success of this listening program reaffirms the philosophy that a destination’s brand is the sum of all the stories their visitors hear about it. By jumping into conversations with visitors and by showing @Queensland’s community that they are actively listening, Tourism and Events Queensland solidified their industry position as a leading destination for an incredible traveller experience, and once again demonstrated that remarkable experiences ignite remarkable storytelling.